The Dream Stealer is now in paperback! 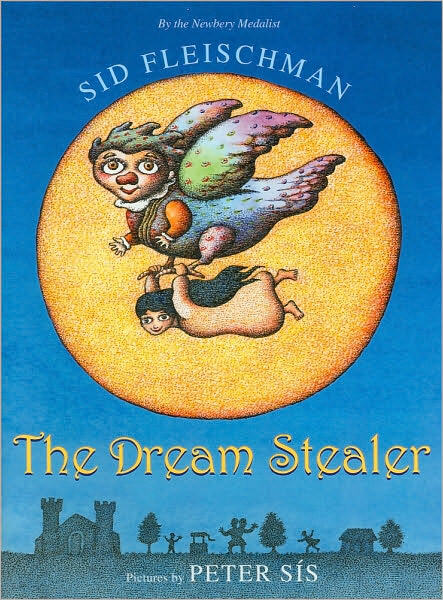 The Dream Stealer by Sid Fleischman teams up again with Peter Sís, his illustrator for the Newbery award winner, The Whipping Boy. As with The Whipping Boy, Fleischman takes on a story with a fairy tale feel, this time setting it in Mexico instead of a kingdom in "long ago and far away." The Dream Stealer begins with the line, "Muchachos and Muchachas, boys and girls, do you know what happened to the fearless little girl who lives in the pink stucco house behind the plaza?" He goes on to tell the story of eight-year-old Susana, who is sad that she has fought with her best friend, Consuela Louisa, and they have not spoken since she moved away to Guadalajara. And, happily, he continues to use Spanish words and phrases with subtle translations when needed. Outside the window of Susana's pink stucco house, the Dream Stealer, who goes by the name Zumpango, although it is not his true name, perches in a tree eating mild green peppers. Zumpango's job has been to lasso the bad dreams and nightmares of children with his spider silk rope and carry them off so that the children can have a peaceful sleep. However, Zumpango has become scared of these demons and cowardly in his work, stealing good dreams instead of bad. When Zumpango steals Susana's dream in which she is reunited with Consuela Louisa on a merry-go-round made of real horses, Susana knows there is something afoot and plots to get her dream back. How Susana does this and the journey she embarks on make for an imaginative and sometimes suspenseful story. One of my favorite scenes involves a room in the house of Zumpango in which he keeps the good dreams that he has stolen. They float around the room like fireflies, the newer dreams shining more brightly than the older ones. It is here that Susana captures a dream that she hides in her pocket to take home as proof of her adventure, not realizing that it will be the weapon that saves her from Thunderdel, a two-headed giant who escapes Zumpango's dungeon and chases after him. Being Susana's only way back to her family, she races off after Thunderdel in an attempt to save Zumpango.